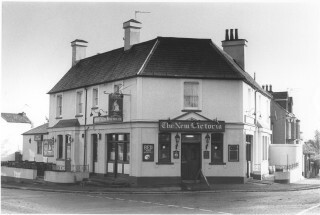 The New Victoria Pub on Queens Road. Queens Road had a variety of shops: there was Boots which had a corner position, Beale’s a ladies shop, I believe a member of the Beale family was a Watford Councillor, Cullen’s the grocers, who had an unusual method of receiving payment, you would hand your money to the shop assistant, who would place it in a container, and attach it to a conveyance, which acted like a catapult, after a cord was pulled, and then released, the container would be conveyed along a sloping stretched cable at speed to a cashier sitting high up in a kiosk, the cashier would then deal with the payment, and return the container back down the slope, which now contained your change, and receipt. Then there was Russell’s the electrical shop, The Technical College, Liptons grocers, Pearks grocers, Trewin’s departmental store, Carr’s second hand book shop, Lloyd Cooper motor cycles, Simble’s tool & ironmongers, the Co-op had a complete self contained store furniture & clothes, shoes etc., and Fad’s/Dunns wallpaper & paint shop. Further along the road was a Water Trough for Horses, and there was a factory that made tape recorders, I believe it was called ‘Walthams’ . Queens Road continued on towards Woodford Road at Watford Junction. This page was added on 13/11/2013. There were four shops In Queens Road that I remember from the late 1930s – early 1940s: Trewins on the north side with the Hornby railway layout in the basement before Christmas each year; a shop further along that sold second-hand gramophone records, from which we acquired several, giving much pleasure and family fun (Stanley Holloway etc); on the south side there was a Tesco that sold groceries below the recommended price (yes, back then!) and, further along, an electrical shop. We had a “Goblin” cylinder vacuum cleaner, and when it stopped working, my dad, who was not “technical”, took it to that shop, where they declared “it needs a re-wind”; we had a friend named Bill Winch, by then an OAP, who lived in Lower Derby Road, and he offered to have a look at it; result – a new pair of brushes. Re-wind indeed! Rip-off merchants are by no means a new phenomenon. “Uncle” Bill Winch was a fascinating man; he had a little workshop in his shed, and he encouraged me to start simple carpentry by making me a bench vice; this consisted of two pieces of wood, about 3″ x 1″ x about a foot long (? ), joined together at the bottom by an ordinary hinge, and tightened to grip the work by a bolt and nut a little way below the top; screwed to an old table (which still serves me as a bench, with steel vice, nearly 80 years later!) it worked fine. In his house, on a wall in “the best room”, he had an aeroplane propeller which he had acquired from Russia, from when he was sent there with the small British force around the time of the Revolution (1917). He was not a Quaker, but he liked to go to their meetings in Derby Road, because he appreciated their quiet form of worship. We were always welcome at Bill and Ada’s house. Childhood memories! Always having had an interest in photography, I remember Hammonds camera shop, where I worked in the sixties and, opposite, Grevilles photographers. When Beechen Grove was extended through across Queens Road, Hammonds and Grevilles were on opposite corners. Hammonds also had a music shop further down Queens Road that sold records and musical instruments. Yes! Miss Dukes’s shop was lovely, and had a very delightful smell of paper and pencils and books. Miss Dukes had very short hair known as an Eton Crop. Other details i can remeber…is a lday further ‘up’ queens road was miss dukes who owned a drawing and painting equiptment shop. I too remember the grocers shop with the buscuits in boxes in front of the counter where you could choose which and how much of any variety available. Trewins of course was in the road and good old woolworths at the corner with the high street. As i was about 4 when we left this street that’s about all i can recall. However there are many tales to tell about the back of our shop and having a bath in a galvanised bath in the kitchen!!! My mum and dad owned 21 queens road, a sweet shop. Mums dad was a confectioner and made cakes for occasions, we left there around 1955/56.